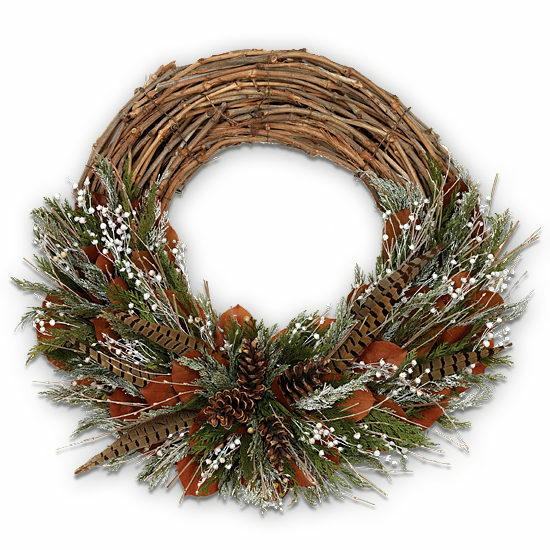 A hit among style-savvy women and men drawn to lodge-inspired decor, this texturally rich wreath boasts the kind of legendary rustic charm people seek out in the Smoky Mountain foothills. Handcrafted on a grapevine base using lush preserved cedar, salal, flax, and pinecones, a soft gathering of pheasant feathers provides a touch of woodsy texture. Add our embossed wreath hanger for easy hanging.